Hundreds of thousands of people have put their life at risk at sea to reach European shores. Their bravery and despair has drawn wide media attention. In reality, though, they are the tip of the iceberg. There were 40.8 million people displaced within national borders worldwide as a result of conflict and violence at the end of 2015 – the highest figure ever recorded and twice the number of refugees in the world. 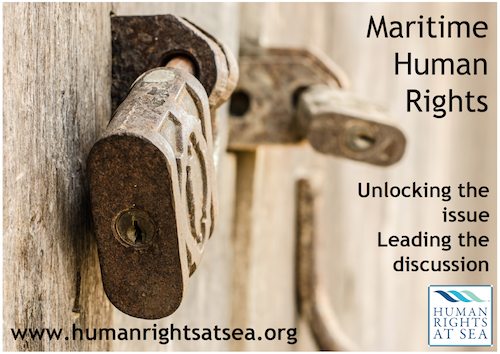 Human Rights at Sea spoke to Alexandra Bilak, political scientist and Director of the Norwegian Refugee Council’s Internal Displacement Monitoring Centre, to find out about the plight of these people. Alexandra lived and worked in the Democratic Republic of Congo and Kenya for 10 years and has worked extensively across Central, East and West Africa. She has directed a number of projects on forced migration in conflict and post-conflict contexts and has published extensively on these themes. HRAS: Where are these 40.8 million internally displaced people? Colombia, the Democratic Republic of Congo, Iraq, Sudan and South Sudan have featured in the list of the ten largest internally displaced populations every year since 2003. In 2015, there were 27.8 million new displacements associated with conflict, violence and disasters in 127 countries. This is roughly equivalent to every man, woman and child in New York City, London, Paris and Cairo grabbing what they could carry and fleeing their homes in search of safety. Yemen, Syria and Iraq accounted for over half of this total. Outside the Middle East, the countries with the highest numbers of people fleeing were Ukraine, Nigeria, Democratic Republic of Congo, Afghanistan, Colombia, Central African Republic and South Sudan. HRAS: Away from the media spotlight and often outside the reach of humanitarian agencies, many of these people struggle to survive in subhuman conditions. What are conditions like? The majority of internally displaced people live in overcrowded rented accommodation, schools and other public spaces, or tents and other forms of makeshift shelter. They face a wide range of protection needs and vulnerabilities including lack of shelter options, lack of safety and security, harassment, lack of livelihood options, gender-based violence, loss of documentation, food insecurity and limited access to healthcare, education, water and sanitation. Internally displaced people have few livelihood options, and many are dependent on humanitarian assistance for survival. Displacement has also forced many families to separate, and there are large numbers of unaccompanied minors. HRAS: How does conflict and violence contribute to displacement? There were 8.6 million new cases of displacement caused by conflict and violence in 2015, an average of 24,000 a day. This phenomenon has been on an upward trend since 2003. Some 4.8 million people were newly displaced in the Middle East alone, significantly more than in the rest of the world combined. Displacement in the Middle East and north Africa has snowballed since the wave of social uprisings known as the Arab spring in late 2010 and the rise of the Islamic State. The region accounted for the highest number of people fleeing violence in 2015 by a wide margin. Yemen, Syria and Iraq accounted for over half of the total. The political and security situation in Yemen deteriorated dramatically in 2015, and the ensuing humanitarian crisis shows few, if any, signs of abating. Violence displaced eight per cent of the country’s population, or 2.2 million people, during the year – more than in any other country in the world. HRAS: Do you see the situation changing in the future? When it comes to conflict-related displacement, obviously the root of this phenomenon is the lack of political solutions and political commitment to end conflict. Until that changes, it’s impossible to say whether there will be more conflicts in the future. There certainly doesn’t seem to be anything indicating a sign of reversing that trend. HRAS: Violence arising from organized crime is also increasing globally. Where are the hot spots? a result, there were at least a million internally displaced people in the region as of the end of 2015, up from 848,000 at the end of 2014, many of them driven from cities suffering the highest homicide rates in the world and levels of violence comparable with a war zone. HRAS: How does displacement associated with conflict and violence compare to that of natural disasters? Disasters displaced around 19.2 million people across 113 countries in 2015, more than twice the number who fled conflict and violence. Over the past eight years, a total of 203.4 million, or an average of 25.4 million displacements have been recorded every year. As in previous years, south and east Asia dominated in terms of absolute figures, but no region of the world was unaffected. India, China and Nepal had the highest numbers, with 3.7 million, 3.6 million and 2.6 million respectively. In India, the impact of two major flood and storm events were responsible for 81 percent of the displacement, forcing three million people to flee their homes. Monsoon flooding associated with cyclone Komen, which struck neighbouring Bangladesh in late July, displaced 1.2 million, mostly in the northern and central states of West Bengal, Odisha, Manipur, Rajasthan and Gujarat. Three large-scale typhoons and a flood disaster together triggered 75 percent of the displacement in China. Three typhoons, Chan-Hom, Soudelor and Dujan, struck four eastern provinces between July and September, destroying homes, causing landslides and flooding and, between them, displacing more than 2.2 million people. HRAS: Each year, a United Nations resolution calls on nations to provide data on displaced people. How is that working? The extent to which that is achieved varies from context to context. Some countries just don’t have the capacity, and there are many gaps. First of all, we are still not capturing all situations of internal displacement. Monitoring on internally displaced people is very different from doing so for refugees, as internally displaced people are seldom registered and often difficult to identify. On top of this, probably the biggest challenge we face is accessing information over time. We tend to get a lot of information when people originally become displaced but then the information trails off as it’s difficult to obtain data on the processes that lead to the end of displacement and the number of people who have fled across international borders. HRAS: Is the distinction between internal and cross-border flight helpful in a globalised world? There is something to be said for and against distinguishing between internal and cross-border flight. Our mandate is about internal displacement, so displacement within the country’s borders. That is important because it sets the responsibilities in a very precise place – the national government. These are people who are citizens in their own country and who are displaced within their own country, so the state is responsible for them and that means that they have a very specific set of rights and legal frameworks that apply. That is very different from cross-border displacement. When someone becomes a refugee in another country, they fall under international humanitarian law. That is important, whereas it is perhaps less important in the understanding the root causes of displacement and in looking at people’s vulnerabilities. Regardless of whether someone actually ends up crossing a border or not, the reasons for the initial displacement are pretty much the same. A Syrian refugee today in Europe originally fled for the same reasons as a Syrian internally displaced person who has remained within the borders. HRAS: In 2016, for the first time, the Internal Displacement Monitoring Centre published its estimates and analysis of people internally displaced by conflict and disasters in a single report. The Global Report on Internal Displacement 2016 (GRID 2016) aimed to provide a more holistic picture of the phenomenon, regardless of cause. Why? What we have seen over the years is that many situations of internal displacement are actually caused by multiple factors. There’s often an overlap between conflict and disasters and political and social factors. By producing a single report, we wanted to refocus on internal displacement itself rather than the drivers and to better demonstrate the overlaps in the future. HRAS: What further insights do you hope to gain in the future? We would like gain a better understanding of the tipping points: what is it that determines onward movement once you’ve become displaced the first time? Many of the refugees that we are seeing today in Europe started off as internally displaced people. They fled their homes and they probably moved internally within the country before they ultimately decided to leave the country. Understanding what either facilitates or inhibits cross-border movement is crucial. What is it that determines that some people are able to leave whereas other people weren’t? The crossing of the border is the symptom of a failure at the national level to provide adequate protection to these people, so it is better understanding those factors at play that is needed in order to prevent these movements in the future, or at least better manage them. When it comes to disaster-related displacement, the majority of displacement we’ve recorded has been attributed to climate-related hazards like floods and storms. Obviously with the effects of climate change in the future that are going to exacerbate the variance in weather patterns, we can only expect that displacements will increase, particularly as vulnerability and exposure of people is not likely to decrease in the future. The opinions expressed herein are the author’s and not necessarily those of Human Rights at Sea.